Coney Issue prints -- finally here. Limited edition prints from the Issue 03 are now finally available. I've decided to include a pair of night photos as well, which did not make it into the zine’s narrative but were so well-loved by all of you on social media. Thanks always for traveling with me. “Meet me again at Coney Island" is the title of the new Doublecrossed issue, and as you would expect, it explores Coney through 2 particular visits to the shore. The 1st trip happens in 2008, as things are falling apart there and I wonder if it can survive. The 2nd trip has me there a decade later, in 2018, to see what only time could reveal. The issue is 56 pages long and has two beginnings and one ending as the book flips around like a carnival ride. A prose poem accompanies each series of bold and colourful images as we bask in the sun and celebrate the magic that is the end of summer at Coney Island. Issue 03, "Meet me again at Coney Island," is here. A thank you and a new zine coming. This weekend was the Queen West Art Crawl in Toronto, where I exhibited prints from Issue 01 and finally sold out of the issue. What a thrill to meet so many of you in person, as well as make some new friends, fans and followers who love photography and understand the joy of printed work. Thanks for sharing the weekend with me! A handful of Issue 02 editions remain, and even better, I’m officially working on Issue 03. Wednesday, I head off for a week in New York to visit with friends and return to Coney Island for inspiration and whatever the light might reveal. 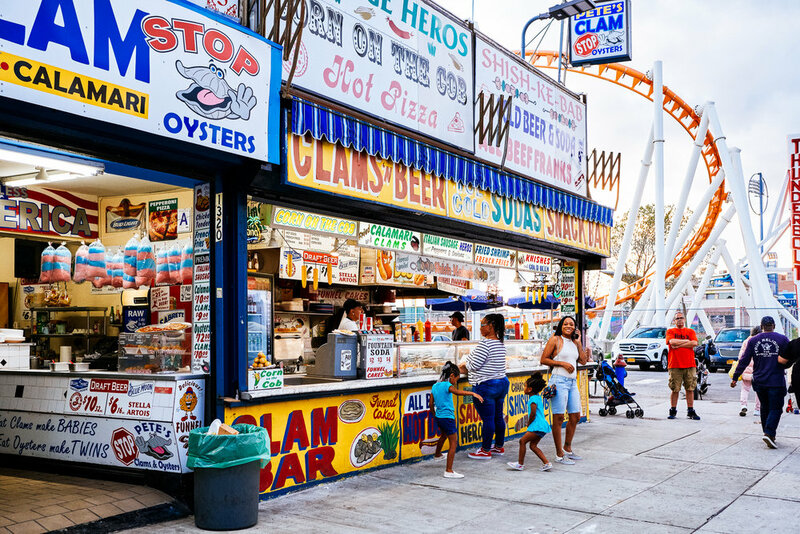 10 years ago, I was inspired to make the Last Summer at Coney Island series there and I’m finally returning to see how the shore has changed, grown and evolved. Will do some writing and image making before returning in October to start crafting a new issue with it all. If you’re in NY and want to meet, reach out! Issue 01 nearly sold out! A couple copies remain of Issue 01, the debut double-issue of my zine series! The rest have traveled across the country and the world, continuing the search, as within their pages, for that something. It's now or never if you'd like to have a copy. New issue coming at the end of the summer. Original mixed media pieces from Issue 02 are yours to keep. After much humming and hawing about whether to sell and give away the original mixed media pieces created for Issue 02, I went out looking for some lightweight frames that could be used to protect the fragile works. These can't be bagged, boxed or slipped in an envelope. They needed fitted casing. If I could find something to encase them, then they'd be transportable, and it might work. Sure enough, success was had at Ikea (of course!) with some simple paperboard and plexi shadow-box frames that were the right size for the job. Six of the mixed media pieces created for Issue 02 are now available for sale. Instead of creating a whole new section here, I've made them available in my Etsy store. If you liked this issue and want to own a piece with all the feeling and texture that comes along with having an original, it's yours to have. Pick-up in Toronto is free (and encouraged!). Grab one while you can. Once it's gone, that's it. It's gone. The new Doublecrossed zine is out now! Issue 02 is a limited run of 50 copies, each numbered and mailed out directly from my hands -- in the spirit of our subject matter here. Issues will be available here until I run out (there's still a little over half left as of today, but don't wait too long). You can sneak a peek at several of the mixed media and collage pieces via the Instagram hashtag #DoublecrossedZine... and please, if you post about Issue 02, be sure to tag! Thanks for your continued support and inspiration. Issue 02 test drafts arrived this week! Some final adjustments, tweaks and edits were made today (including centering that cover visual a little better) and the final has gone back to the printer. Bumped up the paper quality in the hopes that texture shows through a little stronger and played some games with the layout so that the gutter swallows up a little less of the visuals. Fingers crossed. The issue should officially arrive February 19th. Pre-orders are on now. I will ship as soon as I've got them. You can read more about this one here and see previews all week on Instagram. "Fragments of letters to St Valentine" is the temp working title for Doublecrossed, Issue 02, as I turn over stones and mattresses to pull this idea into something tangible. The zine will feature mixed-media collage work and photography exploring themes of love. I'm currently accepting submissions of short pieces of poetry, fragments of prose, as well as drawings or small creations that loosely fit this theme. Dark/light/humorous/esoteric... all works. Going to press at the end of the month. Final Week of "Time Stands Still" Exhibit! This is the final week for Time Stands Still at IX Gallery in Toronto. The exhibit features work by yours truly, as well as local artists Bryan Wilcox, and Louis Au. The 6 pieces I've chosen for this show are from my recent series, "I came looking for you..." which is featured in Doublecrossed Issue O1. A copy of the zine is also on display at the gallery. If you can't make it out, you can preview and purchase any of these works online in the PRINTS section. Each is a signed and numbered edition of only 20. A couple months after the Buzzing Lights book had been released into the wild last year, I got a call from CBC Radio's Q program. Not one, but two(!) producers had pitched the book as a story idea worth covering, and so, it was decided that I needed to be on the show, pronto. I was thrilled and honoured. Later that week, I swung by CBC headquarters and had a great chat with Tom Power live on air. Listen here or download the Nov 30, 2016 episode of Q on your favourite podcast app. I'll be showing new work from Issue 01 in a group show this November. You can preview the 6 chosen works in the PRINTS section. Each piece is a signed and numbered edition of only 20 prints. If you're not in Toronto, all of the editions (unframed) are also for sale here on the site. Thanks, always, for your support! Gallery hours are Mon & Thurs, 1pm-5:30pm and Tues, Weds & Fri, 10am-5:30pm. A year ago today, The Buzzing Lights book was fresh and new on the scene and found itself featured on the cover of the National Post's Arts & Life section. Writer, Calum Marsh, composed a wonderful piece on neon, history, light and my dream come to fruition. One for the highlight reels. I came looking for you but you were gone is now available. I'm so thrilled to finally share this first issue with you and get this project off its feet. This is more of a book than a zine at 80 pages, but hey, you've got to start off with something extra special, right? I'll be sharing a few peeks at the zine on Instagram today through Friday and will add those previews to the listing here as well. While you're perusing, check out the PRINTS section for a set of limited edition prints from this issue. I've slashed $25 off each one til the end of the week to celebrate the launch. Limited Edition Issue 01 art prints available now! Next Thursday, I'm releasing Issue 01 of Doublecrossed into the wild. Photographs featured in this issue were made on the road between California and Tennessee in the spring of this year. I've chosen 6 of these photos to release as 12"x12" limited edition c-prints. There are only 20 editions of each signed print in this release... AND, to celebrate, they are $25 off until midnight on Sept 7th (zine release day). The prints section is now officially LIVE. The zines arrived last week to much fanfare and high kicks here in the studio but, alas, it was short-lived. The inside pages were extremely off in terms of colour and I just couldn't release it that way. This first issue is a double-issue at 80 pages, so it's practically a small book. A few images being off is one thing, but the whole issue? No go. After discussions with the printer, account credits and much debate, I decided to push the release to early September and re-print the entire lot on a different paper this time around. It will raise the price, but it should be worth it to kick things off right. A new shipment will arrive in a couple weeks. Fingers crossed! Welcome to the new Doublecrossed.ca. This is now the home of my new zine series, Doublecrossed. Issues will be available for preview and sale here, along with side project zines, limited edition photographs and other physical creations. A few months ago I published, "goodbye, Ed" to test the waters of photo zine publishing again. Your response was wildly encouraging and I wound up printing and distributing a couple hundred of them around the world. The edition was a 40-page tribute to the landmark department store, Honest Ed's, in Toronto. I have a handful of copies left and they are now the 1st zine listed in the shop.